Against a background of IATA’s estimated 9.3% growth in world cargo volumes for 2017, air freight rates have been dramatically up this peak season. While some rates have eased recently, others are heating up. Most US airlines canceled 7-10 scheduled flights coming in from China between December 22-30, especially those going to Los Angeles, O’Hare and Dallas-Fort Worth. Russia’s AirBridgeCargo and China Southern Airlines have also posted flight schedule cancellations on the China-US route. Given that cargo space on this route is still quite tight, these cancellations are pushing rates back up. Across in Europe, intermittent bad weather has taken a toll, increasing backlogs and contributing to high air freight rates. A typical Asia-Europe shipment on the spot market with flexible transit arrangements normally goes for around $2-5/kg. But over recent weeks, the new norm has become $7-10/kg. The same goes for Europe-US shipments. Shipments to JFK are normally between $0.80 and $1.30/kg, but recently they’ve been in the $5-10/kg band. “Of course, urgent shipments are going for a lot higher. Last week, we saw Hong Kong to Europe going for $21/kg, and Europe to South America at $26/kg. Ocean rates are up too, with mid-December GRIs having some effect on the transpacific lanes, for now at least. China-US West Coast increased 11% from the previous week. 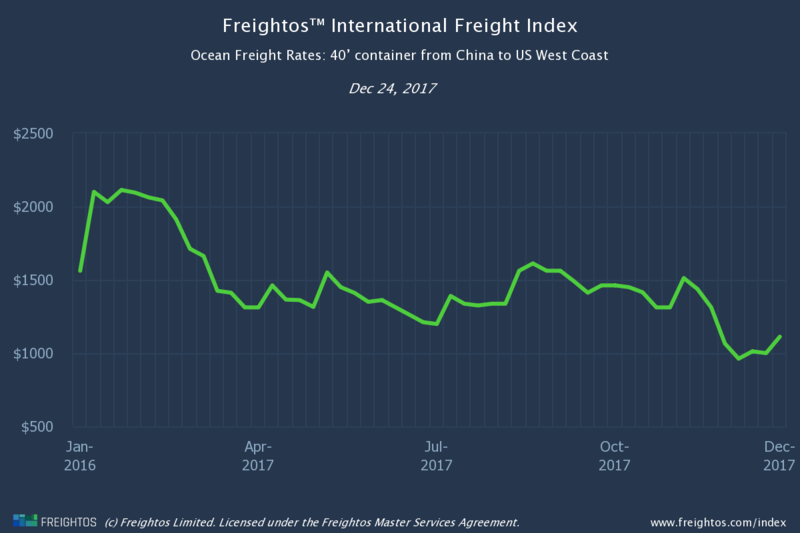 Carriers will be hoping this continues to hold, and upcoming GRIs have an effect, because, with the exception of China-Europe, rates remain well down on last year. The next GRI is scheduled for January 1 is unlikely to be as effective, and there won’t be a GRI mid-month. However, there almost certainly will be a significant GRI on February 1, catching shipments needing to get out before the Chinese New Year closedown. CNY falls out on Friday 16 February this year. The FMC is making good on its intention to scrap the GRI notification process by issuing a proposal to change regulations. The closing date for comments is January 28. China-US West Coast rates increased 11% last week, but are still 29% behind last year’s rates. China-US East Coast rates also increased (15%), but are still 25% behind last year’s rates. Last week’s 7% rise has China-Europe rates virtually catching up on last year’s rates – from being 25% behind five weeks ago to only being 6% behind last week. Europe-US East Coast rates didn’t move last week. They lag last year’s rates by 28% and are tracking just under half of the highest weekly rates this year ($3,549 in W5 and W6).